Cleon Peterson paintings bring a new meaning to Iconic Andy Warhol Soup Cans at Guy Hepner. 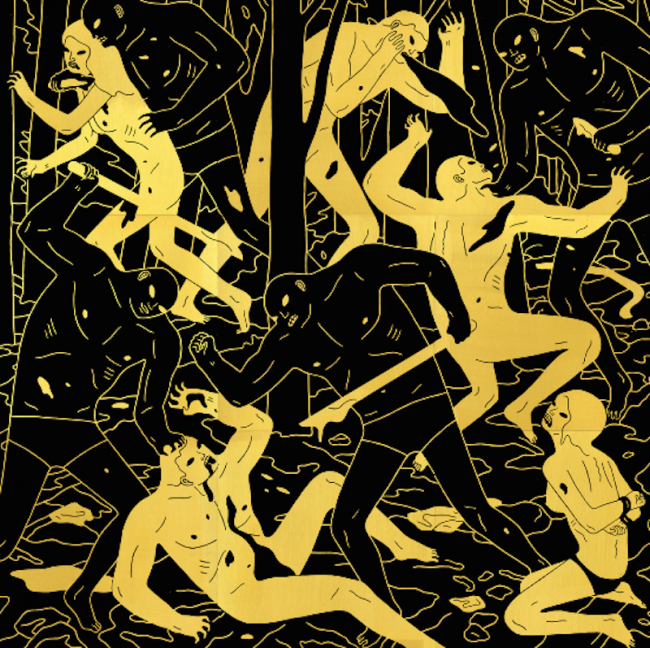 Classic of Cleon Peterson is his depiction of a world where the reality is chaotic, devious, and violent. With an aesthetic rooted as graphic designer and a style reminiscent of Greco-Roman vases, his monochromatic figures narrate apocalyptic imagery such as police brutality, stabbings, and strangulation. Many of those scenes have featured malevolent characters with physical appearances undifferentiated from one another, reduced facial features and whose motions are calculated, their postures balanced, athletic and mechanical. Their victims appear defenseless and in shock, wearing expressions of horror. Peterson’s paintings suggest a classless unsympathetic society and an authoritatively ordered world where evil is the victor of all circumstance. 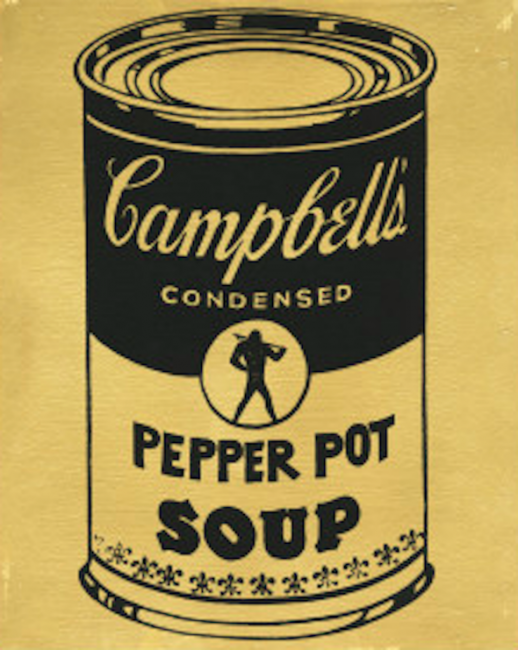 Andy Warhol’s Soup Cans represent the collapse between the boundaries of what was considered art and non-art by ignoring the prejudice on common banal objects. 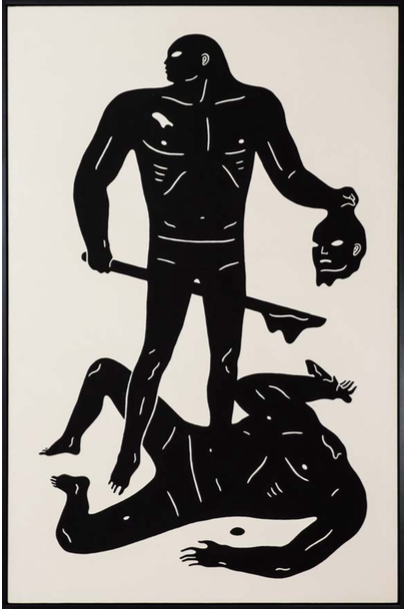 When Cleon Peterson decided take the Andy Warhol’s soup cans and reinvent them in his own perspective, he was making an assertive statement on humanity. In Peterson’s own words, “Pepper Pot represents our current culture at its racial, social, and economical boiling point. 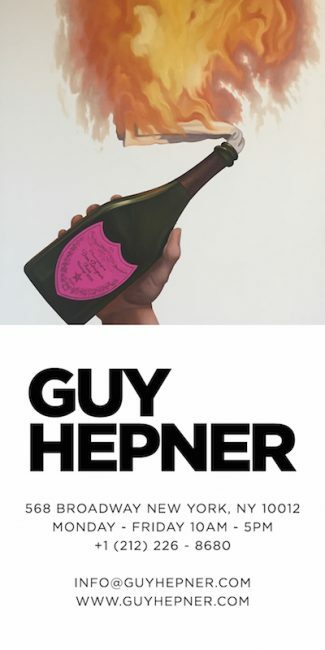 This is combined with Warhol’s idea of the mundane or ordinary. Thus the current climate of pepper pot is the new ordinary in our current culture.” Cleon Peterson’s Pepper Pot Soup paintings are true to his work including only 2 colors, black and gold, and include his classical ‘shadowy’ figure at the center whose stance constitutes balance, strength and power.